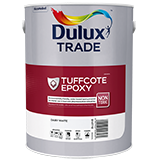 Dulux Trade Tuffcote Waterbased Epoxy Enamel is a solvent free waterbased epoxy enamel for interior use.Does not contain any solvents (zero VOC). Chemical resistant finish coat on steel and concrete surfaces in chemical plants, mines and oil refineries. Clean sand or glass beads can be stirred into freshly mixed paint to give a non-slip finish on floors. Resistant to fresh and salt water, oils and chemicals when fully cured – withstands continuous immersion up to 60°C. Once fully cured (after 4 days), the product can withstand cold temperatures as low as -40°C. Withstands nuclear radiation and is easily decontaminated. Completely free of Mesityl Oxide, and is therefore recommmended for use in breweries.